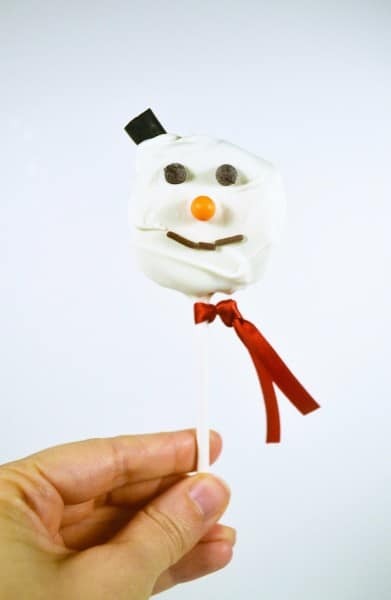 Easy, kid-friendly Christmas treats are one of the most-requested DIYs from readers this time of year. 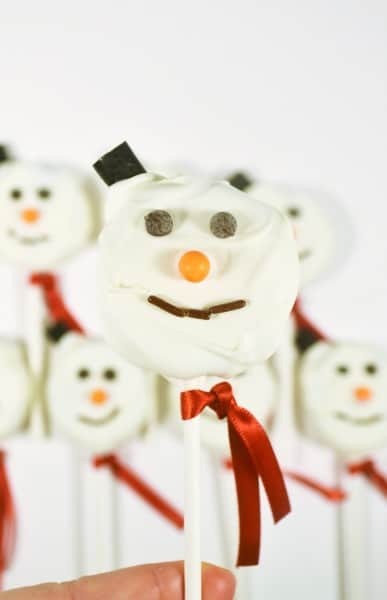 These snowman cookie pops check all the boxes, plus, because they’re not specifically Christmas themed, can be used for celebrations throughout Winter. Again, these materials can easily be switched out. If you don’t have chocolate chips on hand for the eyes, sub in black writing icing or edible googly eyes. If you don’t have the licorice bites for the hat, use a cookie half cut down to size (or even skip the hat altogether). 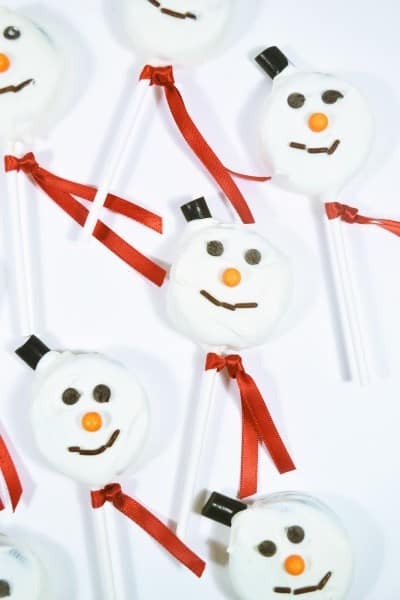 Start by taking your lollipop sticks and inserting them into your cookies. If you buy the cookies with extra cream in the center, you can do this easily without having to pull apart the cookie halves. 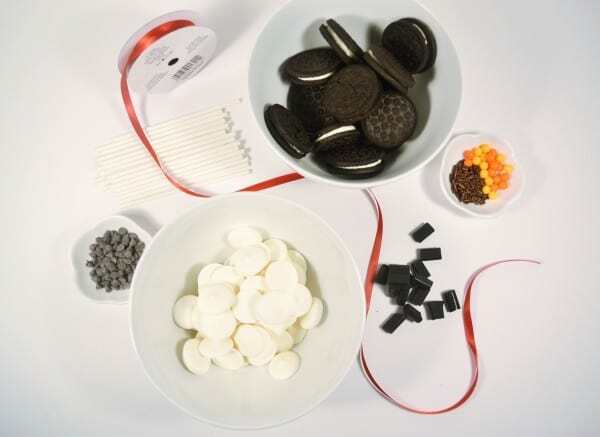 Melt your candy wafers and dip the cookies into the melted candy. Place on parchment paper to harden. If you’re anything like me, melted candy wafers are always too thick for me. To remedy this, simply mix in a tablespoon or so of cooking coconut oil to thin out. 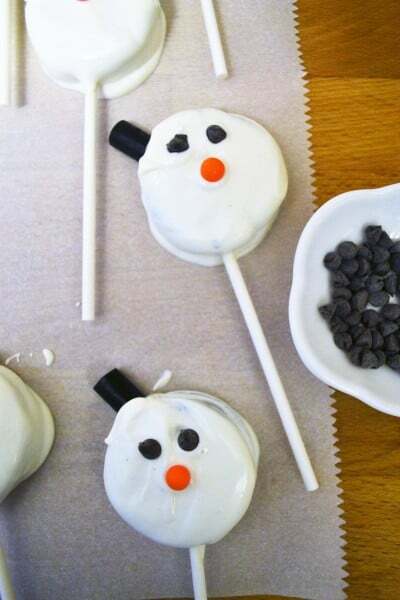 Use chocolate sprinkles and a tweezer to add on a mouth and place cookie pops in fridge to harden completely. Using ribbon or twine, add a scarf, and you’re done! These would make super cute party favors, just add into a glassine or plastic bag and tie with a piece of ribbon. 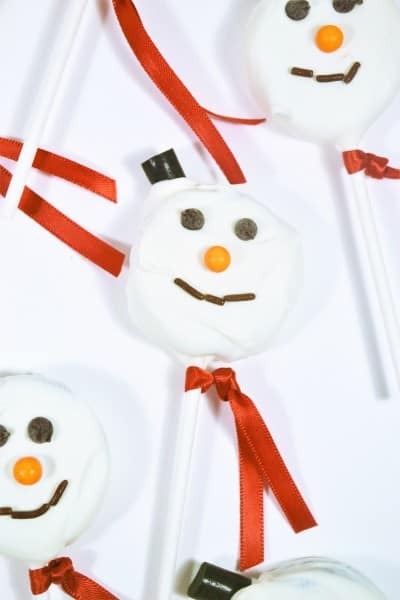 Thanks for reading all about my snowman cookie pops! Have a crafty day!